Mas Domnik 2015 ~ The opening parade for Dominica’s Carnival Celebrations was held on Saturday, January 24th. It began at the Pottersville Savanah, ending on the Roseau Bayfront, with the reigning Carnival Royalty — Queen Francine and King Dice — leading the way. The streets quickly filled with droves of spectators as Sensay, Flagwavers, Stiltwalkers, Pageant contestants, School floats, and Monarchs waved to and paraded for the crowd. The opening of Mas Domnik Carnival 2015 was full of colour and energy, fueling excitement of things to come. Costume Bands showed off their costumes for this year, and a new band called Hysteria was on the road. Visiting bands from Martinique were also with us to kick off Mas Domnik 2015. 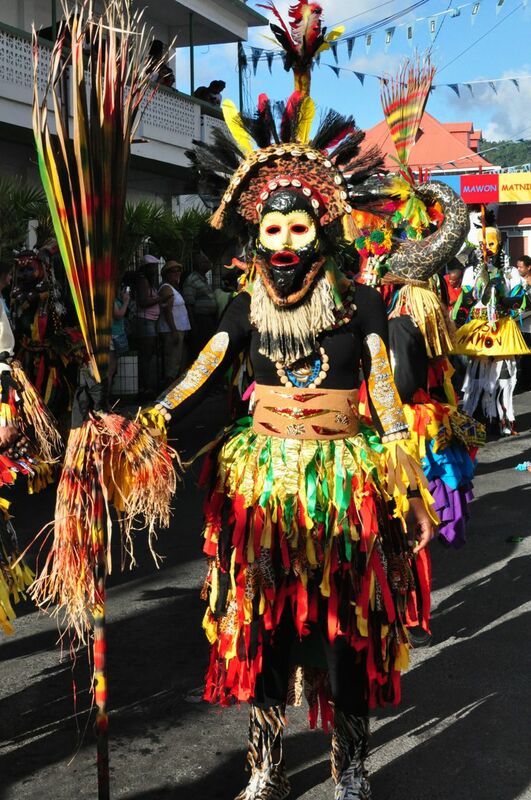 Read more about Carnival in Dominica ~ and find out how YOU can Play Mas with us!